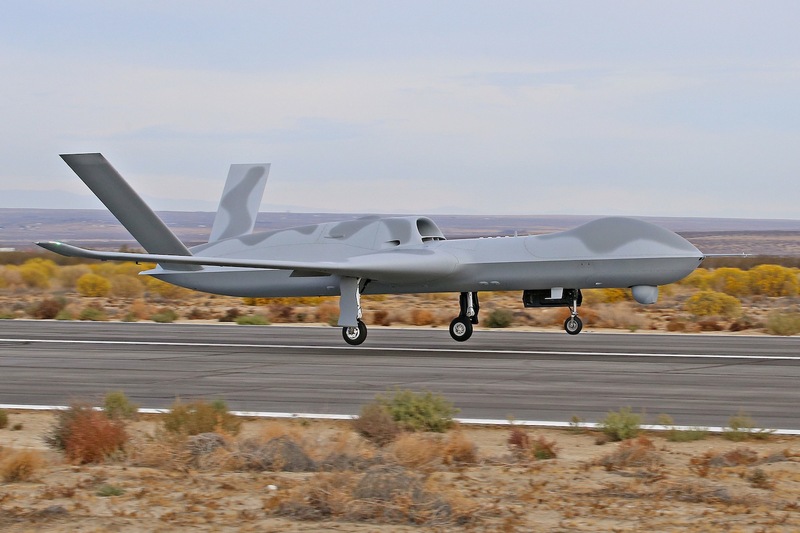 An extended-range variant of the Predator C Avenger remotely piloted aircraft made its first flight in October, manufacturer General Atomics Aeronautical Systems (GA-ASI) announced on November 10. The jet-powered aircraft now has 20 hours of endurance. The maiden flight of the Avenger ER took place on October 27 at the company’s Gray Butte flight operations facility in Palmdale, Calif., GA-ASI said November 10. The manufacturer did not disclose specifics of the aircraft’s performance or the duration of the flight. Powered by a Pratt & Whitney PW545B turbofan engine with a top-mounted engine inlet, the Predator C first flew in April 2009. Its fuselage was extended by four feet (to 44 feet) in 2012 to accommodate larger payloads and more fuel. Earlier this year, the U.S. Federal Aviation Administration granted GA-ASI an experimental certificate that allows it to fly the Avenger in the National Airspace System. GA-ASI extended the wingspan of the Avenger ER by 10 feet to 76 feet, and enlarged its fuel capacity by 2,200 pounds to 10,100 pounds compared to previous specifications. The aircraft carries up to 3,000 pounds in its internal payload bay, 500 pounds less than previously described. The modifications extend its endurance from the original 15 hours to 20 hours. Maximum speed is advertised at 400 ktas, with a maximum altitude of 50,000 feet. As with the legacy Avenger, the Avenger ER carries payloads including GA-ASI’s Lynx multi-mode radar, the MS-177 multi-spectral imaging sensor and the 2,000-pound Joint Direct Attack Munition, the manufacturer said. The legacy Avenger has accumulated more than 13,000 flight hours to date; in July GA-ASI said it had surpassed 11,000 flight hours, most of those hours within the past three years. At the Unmanned Systems Defense conference on October 26, Donald Cattell, a GA-ASI vice president, revealed that the Avenger was used to conduct a leaflet drop in Syria. GA-ASI has also advanced a maritime version of the Avenger for the U.S. Navy’s requirement for a carrier-based unmanned aircraft. That requirement has evolved into an aerial refueling and intelligence, surveillance and reconnaissance platform the Navy calls the MQ-25A Stingray. Recently, the service awarded GA-ASI as well as Boeing, Lockheed Martin and Northrop Grumman risk-reduction contracts to refine their proposals.